Send ups of horror movie franchises are nothing new. The Scary Movie franchise practically created it's own industry. That franchise however quickly ran through lampooning horror movies to lampooning any movie that made money. Given the spotty records of many of the films in the Scary Movie canon, it's understandable why a lot of filmmakers shy away from going down this familiar territory. This is what sets Camp Death III in 2D! apart from many of the films in this genre. This movie unabashedly wears its horror movie, loving heart on its blood-soaked sleeve. It gleefully loves to remind viewers that it is mimicking the Friday the 13th franchise, and if you forget that for even a second this film is more than happy to remind you. Whereas Scary Movie loved the films it was sending up from arms length, Camp Death III in 2D! gives said films the open arms treatment and refuses to let go. As you can probably ascertain, Camp Death III in 2D! takes place at a rustic campgrounds in a nowheresville section of the woods. The film follows Camp Crystal Meph head counselor Todd Boogjumper (Dave Peniuk) as he leads some counselors and much older campers. The fact that many of the campers are older and have a lot of challenges of their own, is, quite frankly, where much of this off the wall film hangs its hat. Once this film establishes who the characters are and what the milieu is, it's time for the killer to emerge and do in their victims in all manner of ways. Of course the killer, Johann Van Damme (Terry Mullett) escapes from an insane asylum to do this. 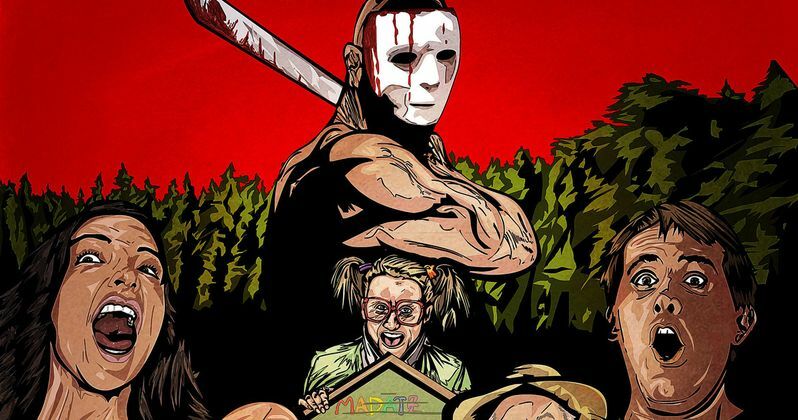 Whether they are taking out the unwitting campers with puppets, plungers or whatever else happens to be available, each kill is meant to maximize the sheer outrageousness of slasher films. If the plot sounds simplistic that's because it is. Camp Death III in 2D! knows exactly the kind of movie it is. It's not aspiring to be Get Out. This film is gleefully in on the joke and that makes it even more funny. With a steady reliance on site gags, physical comedy, and the sheer off-the-wall nature of the slasher film genre, Camp Death III in 2D! doesn't just skewer Friday the 13th), it skewers everything. This movie's only flaw is that it often beats a dead horse into oblivion. Director Matt Frame is obviously out to have fun. The film is decidedly un-PC which is why we end up with multiple jokes about people with special needs and other challenges. It also explains why the campers are a also a mix of various cultures. In today's day and age, to pull this off, you have to make it abundantly clear that you know you are not being politically correct. That doesn't mean that you're not going to get dinged. You may not avoid the internet pile-on of recreational outrage that seems to know no end. However, by making Camp Death III in 2D! so over the top, you can at least let people know that you were purposefully being insensitive. All of this works but that doesn't mean that it always serves the best interest of the film. The biggest strength of Camp Death III in 2D! is not the cheesy effects. Those, like the zaniness of this film also seem like they were purposely done bad. This film has a really good cast. Actors in these sort of "one dimensional" roles really have to go for it and at no point does the cast let the film down. In fact, the way they play their roles is almost relentless. Many of the actors have pedigrees and have worked on bigger budget fare. For example, Angela Galanopoulos (who plays the role of Rachel Diaz) has been in things like The Unauthorized Melrose Place Story. Terry Mullett was on Supergirl and the rest of the cast seems to have a decent footing in today's genre of horror films. All of that plays to great effect here because they believe in their performances. As a result we believe in them and that makes Camp Death III in 2D! work. When there is a site gag that goes on far too long these actors sell it. It is because of their ability that Camp Death III in 2D! works. Also, given the sensitivity around a lot of the issues that are fodder for humor in this film, it might be that the only way to play these jokes is to go overboard. They drive home the point so much that it eventually becomes absurd. All in all, Camp Death III in 2D! lets you know upfront exactly the kind of movie it is. Director Matt Frame and everybody else involved had to have considered this project a labor of love. They knew that they weren't reinventing the wheel. What a a film like this tries to do, ultimately, is make us laugh and remind us why we loved all those slasher films in the first place. Also, given the title, Camp Death III in 2D! was always going to be filled (no pun intended) with deep cuts. This movie is filled with references to not just Friday the 13th but to many horror movies across time. As much as I love horror movies, even I wasn't able to keep up with the barrage of horror inside jokes that came my way. I was so engrossed with this film that I even stopped listing out the ones I got. Initially, I was going to reference them here but then I thought better of it. My viewing experience wasn't about finding easter eggs. I put on this film and watched it like I did all the Friday the 13th movies of my youth. I think viewers should have that same experience, and then be pleasantly surprised with the high IQ of the people behind this slaughter fest.